Soul Retrieval - Hands Over Heart: Practical Shamanism For a Really Good Life that just keeps getting better. SHAMANIC HEALING AND SOUL RETRIEVAL can assist in attaining life goals, restoring health, releasing old behavioral patterns and emotional and psychic pain. It can help to relieve symptoms of anxiety, depression, fatigue and stress. My Soul Retrieval and Shamanic Healing sessions are designed to provide comprehensive healing in a single session. My goal is to restore energy and power and to provide a solid, healthy foundation in a single session. I’ve been doing this work for 16 years, and I have an extremely effective process and team of guides for this work. Please note, if your life has had extremely high levels of trauma and you’re new to a healing path, a follow up shamanic healing session may be recommended. However, for 90% of my clients, all of the above can be covered in a single session. Many of my clients find shamanic work immensely helpful in gaining clarity about issues such as career, relationship and their soul purpose or life lesson. Shamanic healing can be used to address the spiritual aspect of illness- be it physical, emotional or mental. It can increase the effectiveness of other forms of healing, including regular medical and psychological treatment. Shamanic healing works with your essence energy, which can be described as your soul or your spiritual self. It encompasses the intangible aspects of your being, including gifts, qualities, and aspects of who you are. When the physical body dies, this soul or essence continues. In creating a healing opportunity, it is useful to do healing work on the soul or essence level first. The soul or essence is the blueprint that tells the other levels of your being (your life force energy, your mind, your emotions and your body) how to be. 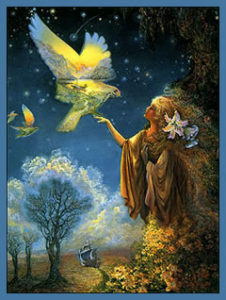 It informs the universe and world around you what type of relationships and experiences to manifest. Shamanic healing and soul retrieval are very effective tools for working on this level. Clients who come with a deep commitment to their personal healing and a willingness to change and grow often experience our work together as life changing. After a healing session, clients often find it harder to swallow their truth or accept situations where they are not being honored, regardless of the economic or emotional advantages of that situation. Please make sure you are open to life changes before you consider making an appointment with me. The work I do on the essence level is very gentle, but it can have a tremendous impact on your life. Because this work takes place outside space and time, it is possible to perform shamanic work from a distance. All sessions are recorded. Life’s traumas, dramatic or subtle, can cause portions of one’s vital life force to become separated, creating dramatic imbalances in our lives. Symptoms such as depression, fatigue, memory gaps or general dis-ease can receive profound healing through soul retrieval. When performing soul retrieval, I journey into the shamanic world and retrieve these separated soul parts and return them to my client. Soul retrieval is one of my favorite healing techniques and one of the most powerful. One session is generally enough to address all past experiences of soul loss and can leave the recipient with unprecedented levels of vitality and wholeness. In a shamanic healing and soul retrieval session, I start with a Power Animal Discovery to identify and connect my client with two power animals. Power animals are spirit guides in animal form that provide a connection to primal life forces, protecting and guiding us in the physical and spiritual world. Discovering and forming a relationship with your power animal may alleviate conditions such as lack of energy, tendency towards mishaps, or feelings of vulnerability. Likewise, a relationship with your power animal can provide support and guidance through major life transitions. Next I look at the overview of my client’s soul or essence and consult with the guides about anything that is out of alignment besides soul loss. Often the guides have me heal contracts, past life wounds, or realign the energy field. Many times a Star Being comes to join the person. If there has been childhood or past trauma, I go back to those events and work to release the energy in shamanic reality to remove the energetic anchor of that painful experience. I also do extraction work as needed, removing spiritual and energetic intrusions. Then I do the soul retrieval work, bringing back the pieces that my client has lost. Finally, I consult with my guides for information about whatever specific issues my client has mentioned- relationship, career, money, soul purpose, etc. Sessions vary since whatever work I do is directed by the guides. My sessions are designed to provide a profound healing that is completed in one session. Because the work is occurring on the soul level, how this experience translates to the conscious human level varies from person to person. It’s not unusual for these sessions to be described as life changing. Sometimes, the results are very subtle, increasing strength and wholeness. The session takes about an hour to and hour and a half. Prior to your session, please read my article on Soul Retrieval. the link below to pre-pay a $25 deposit below to reserve your spot. I was having serious difficulties becoming breathless and anxious, Katie did some energetic healing and identified my power animal. It was a tremendous help and eventually my symptoms disappeared. She also did a shamanic healing for my 8 year old grandson and gave me information that I shared with my daughter so together we could support him in his Indigo-ness. He has been taken off all the ADD medications and is doing well in school. Katie’s gift allowed me to reveal and release very old, stubborn programs that crippled my love of life. I highly recommend the motivated individual consult with her – but be ready for accelerated change! When I read about soul retrieval, it really resonated with me. I’d felt like I had really low energy and that there were parts of me missing for years. The session itself was very relaxing, even if I was somewhat skeptical about the whole thing. My mind was instantly changed when Katie put my soul parts back. I felt a tingling sensation, and then lots of energy shifting around. It definitely worked as advertised! It made me feel whole again, and very unwilling to put up with the treatment I’d been getting at work. It gave me the strength and courage to pursue a different job, which I got within a month. The first work I did with Katie was a Soul Retrieval, which was absolutely life-changing for me! The actual session itself was amazing, but what was really astounding to me was how much I changed for the better in the months afterward. It was interesting, because after some time had passed, I kind of didn’t really think about the Soul Retrieval session I’d had that much. It was a pleasant, distant memory that I had kind of tucked away. But about 6 months later, I remember very distinctly one day realizing that I was operating in the world so much differently than I ever had before! Situations that used to cause me difficulty were now easily dealt with, and things that used to upset me no longer did. It was then that I realized the real benefit of Shamanic work, which for me was that it not only helped me during the session, but I have continued to reap the rewards of the work many months, and several years later. It’s been a “snowball effect” of the best kind!